The marketing and sales funnel is a framework that has been around for a very long time. Almost every organization in the world uses it in one way or another. In digital marketing, the marketing and sales funnel, or simply “the funnel” looks like this image. It is a way of looking at certain metrics, its associated activities, and how they all fit in together. The funnel tells you how each stage flows into the next. This allows you to measure your digital marketing performance. Let’s step back a little bit and take a look at the bigger picture. Effective digital marketing affects the bottomline. This means everything you do digitally affects your sales, expenses, and profits. If your digital marketing activities cannot be directly linked to those metrics, then you are not doing it properly. With today’s technology, every little action your market does online is trackable. A like, comment, visit, click, download — all these are measurable online. And if it is trackable and measurable, that means it can be linked to your overall organizational goals. You only need a framework to do this. The only tried and tested framework to use is the marketing and sales funnel. 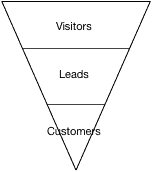 Following the shape of an inverted pyramid, the funnel contains 3 basic parts: top-of-the-funnel (TOFU), middle-of-the-funnel (MOFU), and bottom-of-the-funnel (BOFU). Let’s walk through each one of them below. Creating educational and valuable content designed to attract and generate interest is the focus of the top-of-the-funnel. Since the focus is not to sell, this is where funny and light-hearted content shines the most. Industry and thought leadership content also fall under TOFU content. Activities associated with TOFU are blogging, podcasting, social media, and advertising (in some way). Generally, any form of content creation starts at the top-of-the-funnel. The main metric to track at the TOFU stage is visits to your website. Lead generation (or conversion) is the main focus of the middle-of-the-funnel. It is the next logical step from TOFU — which is concerned with generating traffic. Now that you have the traffic to your website, it’s time to focus on converting these into leads. These are mostly done through the combination of marketing offers, landing pages, and thank you pages. The activities in MOFU are similar to the TOFU activities except for “gating” the content. Gating simply means not letting the everyone gain access to the content you created. For example, this white paper I wrote targeted to business owners is an example of a gated content. Aside from PDFs (like that white paper I made), gated content can also be workbooks, email courses, spreadsheets, templates, etc. The main metrics to track here are leads and lead conversion rate (visitor-to-lead ratio). An effective lead nurturing strategy often separates the successful businesses from the struggling ones. Why? Because without a proper lead nurturing strategy, you need to keep on generating new leads every month. Given that more than 90% of leads you generate are not ready to buy, all the effort you spent acquiring them will just go to waste. Remember that if they are not ready to buy now, that doesn’t mean they won’t buy in the future. Without a proper lead nurturing strategy in place, you are forced to get more new leads just to reach your customer and revenue targets. Some other BOFU activities are sales calls, meetings, and presentations. Proposals and product demos are usually at this stage as well. The primary metrics at this stage are customers, revenues, and customer conversion rate (lead-to-customer ratio). Direction. The funnel generally flows from top-to-bottom. Volume. Looking at the shape of the funnel, you’d notice that the top-of-the-funnel is wider while the bottom-of-the-funnel is narrower. There are more people who know you and visit your website. A small part of those visitors converts to leads. And an even smaller part of those leads becomes your customers. Proper strategies and tactics exist at every stage of the funnel. Each is measurable and have their own metrics that you can track. Improve these metrics and you will see an increase in your customers (and consequently, your bottomline). The marketing and sales funnel is a framework you should use if you want to be effective with your digital marketing. Approaching the components of digital marketing piece-by-piece might give you good results. But are you satisfied with being good? There are a lot of variations over the years for the funnel, so I merely presented the simplest one. Are you using the marketing and sales funnel? How are you using it? How’s your experience with the funnel?